Finally your opportunity is here! Our purpose in expanding into surf coaching from personal training is to meet the needs of those who have dreamt about learning to surf but have not had the means to achieve their dreams. Our coaches are passionate about both helping others achieve personal goals and surfing – So we have now combined the two, to create the ultimate surfing experience. 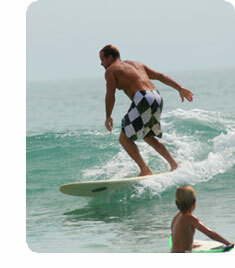 Surf Skool adult program aims to take the first time surfer to an experienced and confident surfer in minimal time. Participants will be taught the fundamentals of surfing, equipment, culture and style combined with an understanding of the ocean, the weather and the wonderful part nature plays in our sport. Our program will also teach lifestyle change in making surfing part of your current exercise routine, as well as educate you on surfing etiquette and culture. By learning the art of surfing the Surf Skool way you will reap the health rewards of improved fitness, posture, flexibility and stress management. Like all of our courses adults to need to be able to swim a minimum of 50 meters unassisted.